I have been playing golf since I was 14 years old (that was more than 30 years ago!!) and although I didn’t know it then, I was already practising what have been variously termed visualization, intention, hypnosis and being in the zone. As a result of using such mental techniques, while still in school, I was already a single handicapper (as I am today still). As an example, there was an instance when I had registered for another clubs’ Open Competition, and there were holes that I could definitely birdie to help me post a good score. As is my usual practise, I would think about how I would play these holes when I came to it. I visualised my tee shot, approach and putt. Additionally I would at the same time allow myself to feel calm and confident as I visualised the shot. One particular hole always comes to my mind when I think of how the power of the mind always influences the outcome even before the shot is played. This was a short par-4 of only 270m. There were trees on either side of the approach to the green that made a wayward drive a definite bogey. There were also bunkers on each side of the green. At 70m before the green, in a valley is a water hazard running across the fairway. Definitely reachable with a good drive, which would set me up for a birdie, but with dropped strokes to pay for any mistake. 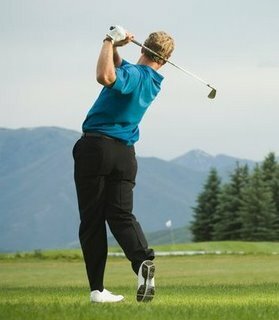 In my visualisation exercises, I chose instead to tee-off with an iron to a perfectly flat spot before the water hazard, and from there pitch the ball with my wedge close to the hole. Once on the green I made the perfect putt for a birdie. For the next few days right up to the day of the competition, I played that hole in my mind in exactly the same way…no variation. When I came to the hole in question on the day of the competition, my first instinct was to reach for my driver!! However, sense prevailed, and I used the same club that I had imagined myself to be using. As I addressed the ball, a sense of calm came over me. I only saw the ball sitting up on the tee, the club head and my hands on the grip. From then on everything was so easy…the backswing, the pause at the top of the swing, the downswing and the follow through. Even the impact felf so right as the club head hit the ball to send it on its way. The flight of the ball was a nice gentle draw on its way to the spot that I knew exactly where. When I walked up to the ball, it was lying in a perfect spot. It was sitting up nicely, and the flag was framed perfectly in between the trees guarding the approach to the green. Surprisingly, my heart beat maintained itself at an even pace, and as I stood over the ball with the wedge in my hands, the same calm feeling filled my mind and body. I played the pitch with a slow smooth swing, taking just the right amount of divot after the ball. The ball flew into the air, right on line and I just knew that it would be a good shot, even though the hole could not be seen from where I was in the valley. I didn’t know where the ball stopped. Was it really close to the pin or not? But when I reached the green and saw one ball no more than one foot away, I knew it was mine. A definite birdie! Only then did I allow myself to get excited. And I remember thinking to myself that this was exactly how I had played it out in my mind over and over again.